This handsomely produced book is the result of an ambitious project undertaken by the Environment Centre of the Northern Territory. It will be a valuable resource for years to come, not only for Territorians but for anyone living in, or visiting, North Queensland and Northern WA. 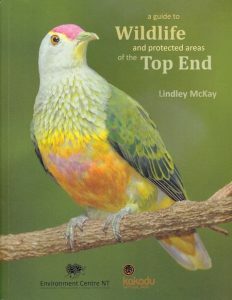 The Top End has more wildlife and fewer people than most parts of the world so the wildlife is not well known. Guides to Australian birds, butterflies, dragonflies, reptiles, spiders, etc, do try to cover the Top End but inevitably pay more attention to temperate Australia, where their authors and most other Australians live. If you’re in the North, it’s easy to collect a whole shelf full of natural history books and still not find what you need. McKay’s single volume won’t replace all of them but will quickly and easily answer most non-specialist questions about everything from mussels to dugong to caddis-flies to melomys – and most of us are non-specialists at that level of diversity! 700 species are documented, mostly two per page, in 2000 photos accompanied by range maps and concise, informative text. The introductory sections will be particularly useful to newcomers and visitors, presenting an overview of the very different types of Top End habitat, descriptions of the national parks and other protected areas, and introductions to important species (e.g. saltwater crocs) or groups (e.g. invertebrates). It would be good to encourage local bookshops and libraries to put the book on their shelves, since small publishers often have difficulty spreading the word about their work. On the other hand, it is available directly from ECNT via this link and buying it from them means that all the money goes to a good cause.